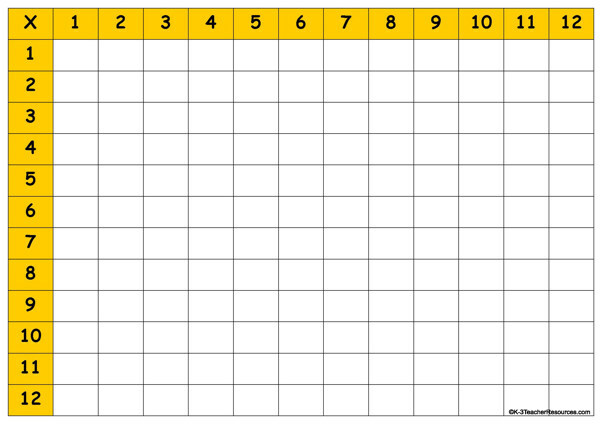 Blank Multiplication Chart or grid – Children fill in the blank chart, then colour all the number patterns. Children fill in the blank chart, then colour all the number patterns. Use along with our multiplication games and activities flashcards. LOGIN or Signup as our GUEST to download these free resources. Children fill in the blank chart, then colour all the number patterns – for example, colour the even numbers green, odd numbers red, multiples of 10 purple. Use this chart as a blackline master template. Fill in some of the answers then print as worksheets- children fill in the rest. Partner work – Each partner fills in some of the chart, partners swap charts and complete each others chart. They then check each others work and can give praise, rewards, ticks etc.